Welcome to Pierre's Farrier Service! 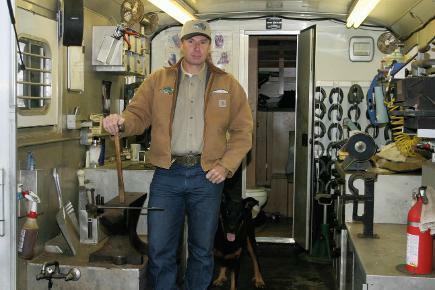 I specialize in quality hot and cold shoeing, treating each job as corrective shoeing. This means I'm not just simply replacing the shoe each time. I take the time to truly examine your horse's growth and wear patterns, making sure each hoof stays correctly balanced which is so important in keeping your horse comfortable and sound. I provide the same great care for every horse, from top performers and working ranch horses to backyard and rescue horses. I adapt my handling to comfort horses who have had previous bad experiences. My background in riding (Jumping, Dressage and now Western) allows me to understand your needs. I feel the key to my success has been my equine science education combined with a long-term apprenticeship and high level of continuing education which lets me keep up with changes not only in veterinary medicine, but in technology advances. These reasons along with the fact that I truly love shoeing horses has made my business a success.